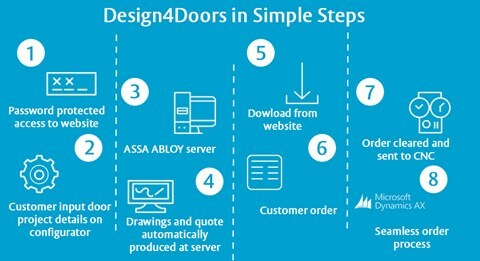 Design4Doors is an innovative online door designer application that enables ASSA ABLOY Security Doors' customers to design their own doors. The service makes it easy for users to select from a number of features in order to create an overall doorset that meets specific project requirements. 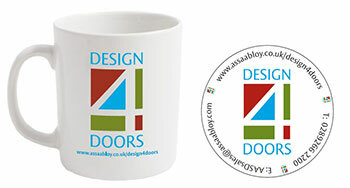 Sign up for Design for Doors today and receive a free mug and coaster as a thank you. Not only does Design4Doors generate a tailored drawing, but it also provides the user with a job specific quotation, which can easily be converted to an order online. Just sit back and relax while the Design for Doors online application saves you time and gives you access to your designs with a click of a button. See how the application works in this video (full screen mode). Through direct integration between Design4Doors and the CNC machinery in our factory, the chosen design can be seamlessly progressed into production. This seamless transition from customer to manufacture reduces risk of error and ultimately shortens lead-times, therefore offering the industry a true world-class service. 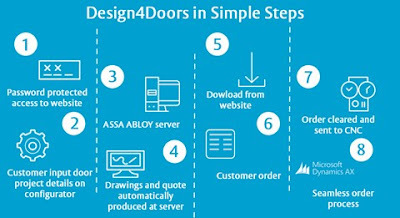 Design4Doors not only generates a tailored drawing but also provides the user with a job specific quotation, which can easily be converted to an order online.